You are reading page 5 of New England Tech in Warwick, RI. If you want to start from the beginning Go to First Page. I go to RIC, we are the cheapest and the best in the state (check out our NCLEX pass rates) so if you think you get what you pay for you should do some "Evidence based research" I wouldnt want someone who paid way to much money so they could get through the program fast as my nurse, no thank you. I have great clinical experiences at RIC, I've passed meds, hung IV's, inserted and d/c foleys. I've participated in codes, saw multiple surgies (c section, cholycystectomy, retina repair, hernia repair) I've helped deliver (like caught the baby, cut the cord, APGAR's, vitals and medicated the baby) several vaginal births, given IM, SubQ and intradermal injections. My psych clinical was on a locked ward at the VA, I've been at RIH, Women and Infants, Hasbro and a clinic and middle school. Nursing is more than flying through some classes...seriously do your homework....critical thinking and evidence based research are a big part of nursing you should start practicing now. NE Tech IS an accredited school, it is that the nursing program is very new and has not yet been accredited. As with all new programs, the first class must complete the course and then can be accredited. The NLNAC has awarded the school candidate stautus until Jan. 2011 (next month) and all graduates will then graduate from a fully accredited program.The school itself IS indeed a regionally accredited school by the New England Association of Schools and Colleges and has a fine reputation. As far as cost, yes, very expensive, but it is important to remember, it is a private college. One can attend any private college and spend even more than NE Tech costs. For instance Prov. College, RISD, Bryant University etc....all of which cost twice as much as NE Tech. As far as the nursing program itself, I have heard from many who are absolutely thrilled with it. Several have stated that the labs are far superior to what they experienced at CCRI or RIC. So, I think it is a matter of what fits for the student. RIC is an excellent school, and I would personally not want to spend the extra money to attend a private institution for the same degree, But that is just me. CCRI is also a good choice. My son attended NETech for graphic arts. Very expensive, very fast paced, TONS of experience, and fabulous education. yes, we are still paying the loan, but were very happy with the school. My other son went to CCRI for his 2 year law enforcement degree. Also excellent. It is just a matter of what fits. Ah yes, for that insane amount of money the labs should indeed be better. It all depends on what you are looking for. Clinicals are offered at area hospitals inc. Hasbro Childrens and the professors who run the program had taught at URI for many years. Please, let us let those that are enjoying this program feel good about it. Money is an issue for many, and that would be a determining factor, but for others it is less of a factor for whatever reason. It is all about what fits. I am sure you will be successful, as RIC is also a fine program with an excellent reputation. I would not feel any less safe if my nurse was trained at URI, RIC, CCRI or NETech. Enjoy your time as a student and learn all you can no matter where you go. BTW, I am at CCRI for the Renal Dialysis program. I made the choice not to go into the nursing program for various reasons (age, time, desire NOT to be overloaded with paperwork at each shift, and a close personal connection with dialysis). I feel my education is more than adequate and I am getting the biggest bang for my buck, but after the experience my son and several others I know had at NE Tech, I would not hesitate to enroll in that school if I felt like it fit my profile. Best to you in all your endeavors. I was just wondering, for those of you that currently attend NETI. i was just wondering what your class schedule was like..what time do you start classes etc..
To BellaLee1023 : you sound very angry for some reason, if you think your school is better and you would never go to NEIT, then what are you so angry about, and what do you care? Personally, I currently attend NEIT and I am happy with my decision, it is what is right for me and my family. Your situation is obviously right for you, If you are becoming a nurse than maybe you should remember the various types of people, personalities, and situations that people have and not to use your own bias in your career !! CNABESS.... As for your sons degree from NE Tech, thats excellent for him but we arent talking about graphic design. I think CCRI is a good school for nursing Ive worked with their students and for the most part they are good, but they are still being overlooked for jobs in comparision with a nurse who has a BSN, thats the point Im trying to make. I know this because I have friends who have had this exact problem. Now if you are a new graduate from NE Tech's fast track program compared to someone with their ADN , and then compared with someone who has their BSN , it just seeems like thats the bottom of the totem pole for the most amount of money. Manda and Britt, I do not have a "vendetta" against the school, my first thought is about the impact this "fast track" nursing program will have on patient care, to answer your question, thats why I care :) and if you think your level of education doesnt effect patient care then I hope you do learn that in your nursing theory class, does NE tech have a theory class? What is your plan of study? (I really am curious) My response and "unwarranted complaints" were to kncktc, not you! So if you are an educated well prepared nurse, certainly nothing I say should make you feel like you are not, and if it does perhaps you are lacking confidence, Im sorry you feel like I was angry with you but I wasnt responding to you lol soooo....anything else? "The 2008 ANA House of Delegates RESOLVED, that the American Nurses Association support initiatives to require registered nurses (RNs) to obtain a baccalaureate degree in nursing within ten years after initial licensure, exempting (grand-parenting) those individuals who are licensed or enrolled as a student in a nursing program at the time legislation is enacted; and be it further RESOLVED, that the American Nurses Association advocates for and promotes legislative and educational activities that support advanced education in nursing. 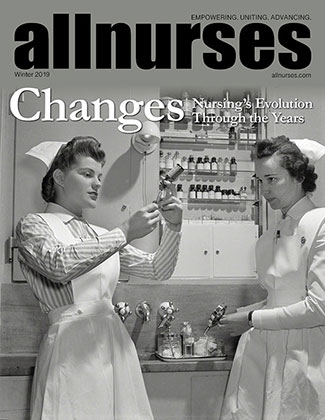 ANA's efforts to influence nursing education date back to 1965. Passage of the Comprehensive Nurse Training Act in 1964 prompted the American Nurses Association (ANA) Committee on Education to study nursing education, practice and scope of responsibilities. At the time, the study recognized the increasing complexity of health care and changes in practice, raising concerns about hospital - based diploma education programs. Subsequently, in 1965, the ANA Board of Directors adopted the Committee on Education's statement, which became ANA's "position paper" and contained the recommendation that the "minimum preparation for beginning professional nursing practice should be baccalaureate degree education in nursing. The position paper noted that the educational programs of the time prepared workers for current practice and structures, not for the future. Also contained within the position paper was the description of three levels of nursing education: baccalaureate education for beginning nursing practice, associate degree education for beginning technical nursing practice, and vocational education for assistants in the health service occupations. The 1965 ANA position paper was later reaffirmed by a 1978 ANA House of Delegates resolution which resulted in the recommendation that by 1985 the minimum preparation for entry into professional practice would be the baccalaureate degree. The designation of two levels of nursing practice, professional and technical, was reaffirmed. What was envisioned to be an orderly transition to an educational system of two levels and subsequent differentiated practice never occurred. Practice has continued to evolve with increased specialization, greater demands related to technology, paperwork, and responsibility for coordinating and supervising care provided by other workers. Declining reimbursement rates have had a great influence on staffing patterns. Nurse positions have been eroded with nurse extenders (assistive personnel) filling positions previously designated for nurses; leading to fewer nurses supervising more assistive personnel in provision of care for increasingly complex patients." It is also known that…. Research has revealed the relationship between advanced education and patient outcomes, such as lower patient mortality. Baccalaureate prepared nurses are more likely to report higher job satisfaction scores in relation to opportunities for growth, and to remain in practice longer than others. Increasingly more complex healthcare needs of a multi cultural and aging population underscores the need for advanced education. A stronger theoretical base and foundation in nursing research is needed as a result of the shift to evidenced based practice and expansion of more sophisticated technologies, pharmacologic and other treatment modalities. Sound leadership skills are essential for case management, as well as to support the ability to delegate and supervise care provided by dependent practitioners (LPNs) and nurse extenders within the framework of varying care delivery models. There is a shortage of nursing faculty and subsequent limited cadre of nurses from which to draw. Advanced education will better enable nurses to practice as full partners on a multidisciplinary team, given the education advancement of a number of other health professions: Social workers - master’s degree; Physical therapists – master’s degree in 2002, doctoral required by 2020; Pharmacists – PharmD has replaced the bachelor of pharmacy degree. The military (US Army, Navy and Air Force) require a baccalaureate degree for nurses on active duty. The Veteran’s Health Administration requires a baccalaureate degree for nurses wishing to advance beyond entry level appointment. Internationally, the baccalaureate degree in nursing is required upon entry into the profession in the Philippines, Australia, Ireland, and half of Canada’s provinces. The Royal College of Nurses voted to support a transition to require a university degree for professional nursing practice. Personally, I am not in the fast track. The fast track is for students who have completed all general education classes and have gotten a B or better in them. And I believe most of us are planning on moving on to a BSN as soon as we graduate. However, it's not very nice to look down upon ADN registered nurses. CCRI is only an associates program too and they do just fine. I am a fast track student and I am SUPER CONFIDENT that I and the rest of my class will be excellent providers and advocates for our patients. I think that considering the amount of time and energy a specific person has put into this thread trying to make a point, I am not the one lacking confidence. How much and how many times do you have to say something to convince yourself that what your saying is true?? Nurses are suppose to work together, and I find that there are so many students so thirsty for success they will crush as many people's dreams as they have to in order to be on top. This is a sad world we live in. I Personally applaud all Nursing students whether it be diploma, associate, or bachelors students. Maybe if you understood how hard we all work in the fast track program and what we are going through you would understand. Maybe you should call the director of the nursing program and speak with her about the fast track program, and she will give you an update on our academics if you are so worried. 739-5000 ask for the director of the nursing dept, she is always willing to take a moment and explain what people don't understand.